Inverleith House presents the first UK showing of American artist John Chamberlain (1927-2011), as part of this year’s Edinburgh Art Festival. Featuring work from early to mid career, the exhibition demonstrates Chamberlain’s use of unusual and hard-wearing materials; transforming discarded car parts into dynamic sculptures, foam into sculpted works and foil into large, outdoor pieces. John Angus Chamberlain was born in 1927 in Rochester, Indiana and died in 2011 in New York. He attended the Art Institute of Chicago (1951–52) where “It’s all in the fit” became his mantra. His first sculptures, in welded steel, were exhibited in 1954 and he attended Black Mountain College (1955–56), moving to New York in 1956. His first retrospective was at the Solomon R. Guggenheim Museum, New York in 1971, where his most recent retrospective, Choices, was also held (2012). 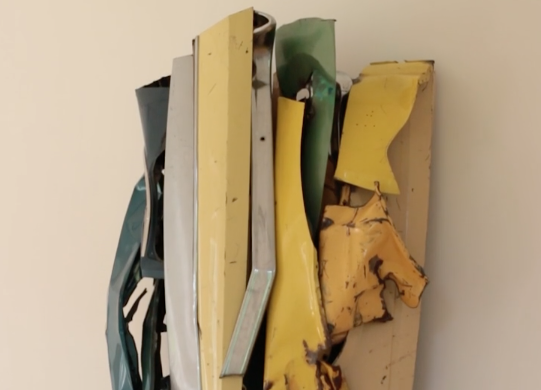 John Chamberlain’s work is displayed at Inverleith House, as part of the Edinburgh Art festival, until the 4th October 2015.